Clawfoot bathtubs are most probably the best freestanding bathtubs around – for numerous reasons. What makes them great is that you can choose from different materials. Some are made of lightweight materials such as acrylic or a fiberglass acrylic blend. Yet others are made of more traditional cast iron or copper. Of course, the latter two might be a tad more expensive than their counterparts that are made of modern materials. Ultimately, when deciding on the best clawfoot tub, you need to a number of things into consideration and think about reading a few reviews. 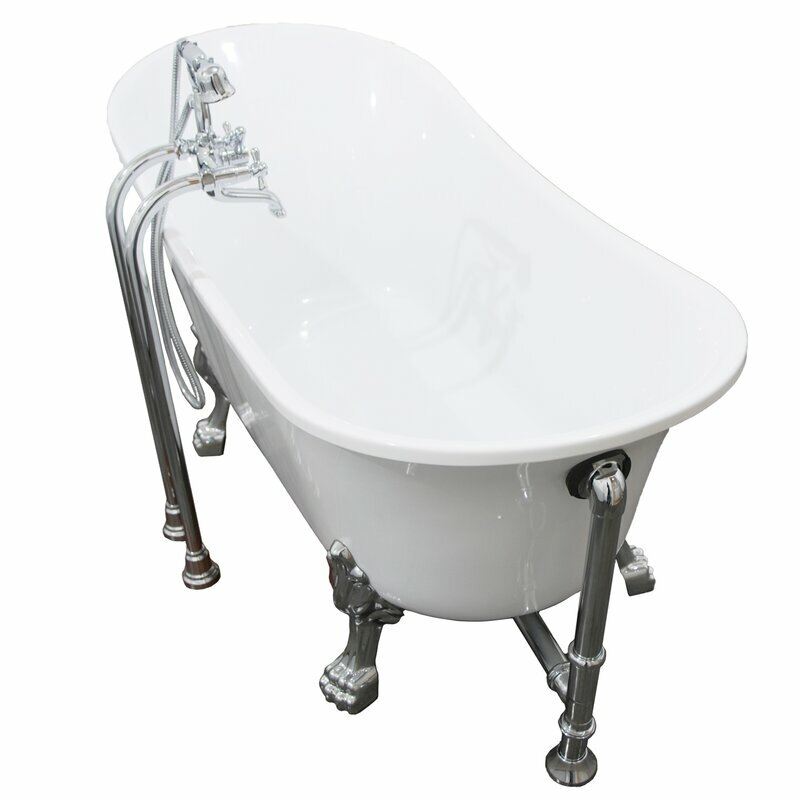 Clawfoot bathtubs have been around since Victorian times, with their popularity waxing and waning. These days, however, they are often seen as a high-end luxury item, and a must have for the more discerning homeowner. There are, however, different types of clawfoot tubs, so picking the best clawfoot tub, at the end of the day, may be a matter of taste. Although a pedestal bathtub is not, strictly speaking, in the same category as a clawfoot bathtub, it is worth an honorary mention. This is because it just so happens to be a freestanding bathtub that stands alone on a solid base – i.e. it has no clawed feet. As the name indicates, the slipper clawfoot bathtub has a slipper shape. The one end is raised higher than the other, which is approximately the height of a regular bathtub. The faucet and drain placement is usually at the side of the tub that is lower. This bathtub has the same shape as a regular clawfoot bathtub. The only exception is that the placement of your drain is in the middle of the bathtub while your faucet placement is to the side instead of the end. The double slipper bathtub has two raised slipper sides with the faucet placement to the side of the bathtub. Here, the drain placement is in the middle, whole this section is also slightly shallower than the two seating ends. 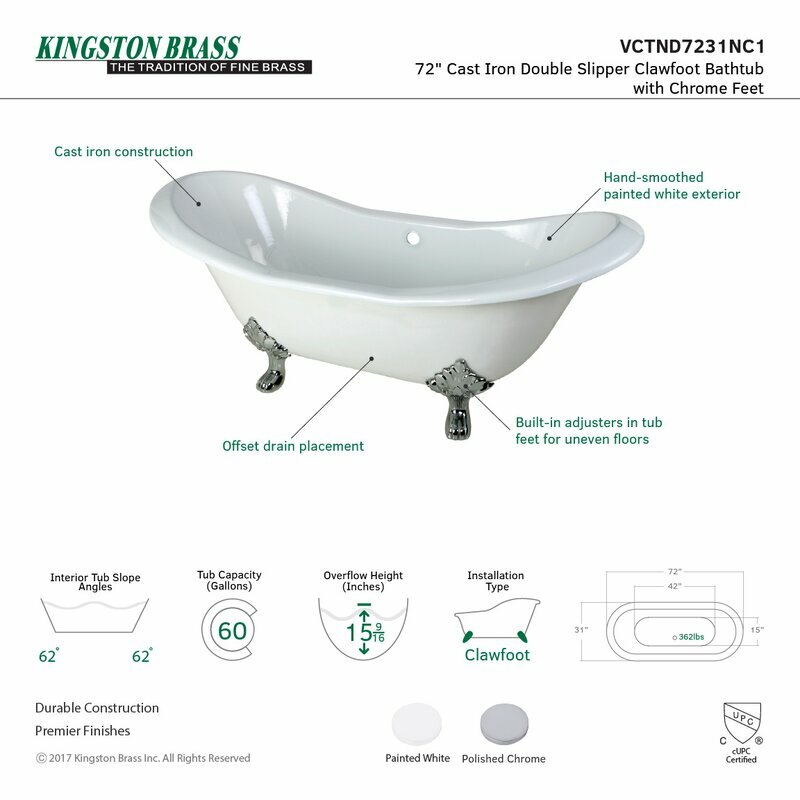 The classic design is your most common version of the clawfoot-style bathtub. Although it has the same classic shape, the rim is straight and level with no raised sides. It typically features a curled lip all the way around the bathtub, with the faucet and drain usually at the one end. Clawfoot bathtubs, no matter the design, tend to give any bathroom a more luxurious, rich look. But, as with just about any type of bathtub, they have their pros and cons to consider before you make an informed decision. Freedom of placement, Because they are freestanding, you get to choose exactly where you want to position your bathtub – whether against a wall or the middle of the room, you get to decide. Just as with the placement of your clawfoot bathtub, you can also have your plumbing wherever you choose plus, depending on your bathtub’s faucet placement, you can choose your type of faucet according to the style of your tub and bathroom. Also, you have the added benefit of being able to have a central or end drainage placement. 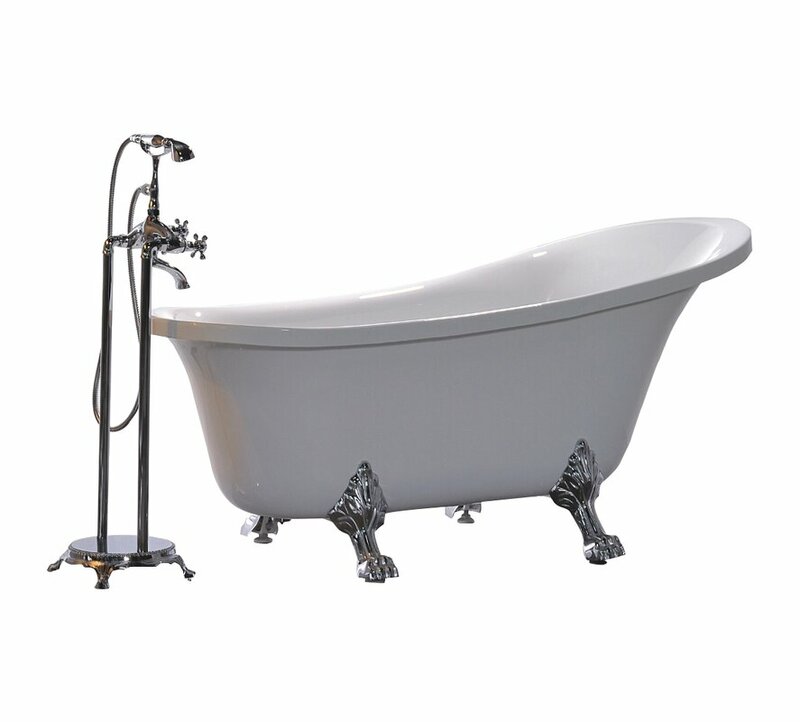 Many clawfoot bathtubs are easily paired with handheld showers that rest on a cradle. This makes washing and rinsing your hair while in the bath so much easier. Although the more authentic style of clawfoot bathtub is made from either copper, cast iron, and/or porcelain, these bathtubs are now available in lightweight materials such as acrylic, or an acrylic-fiberglass mix. The pro with the newer versions is that, because they are lightweight, you can easily place them in an upstairs bathroom without having to worry about their weight causing them to crash through the floor. These newer bathtubs are also warmer to the touch while their finishes do not chip as easily as the older versions. A clawfoot bathtub that has a hand shower attachment to the faucet is easier to clean, and it is great for cleaning pets too! The fact that they have feet also mean you do not need to bend down so low in order to do so! 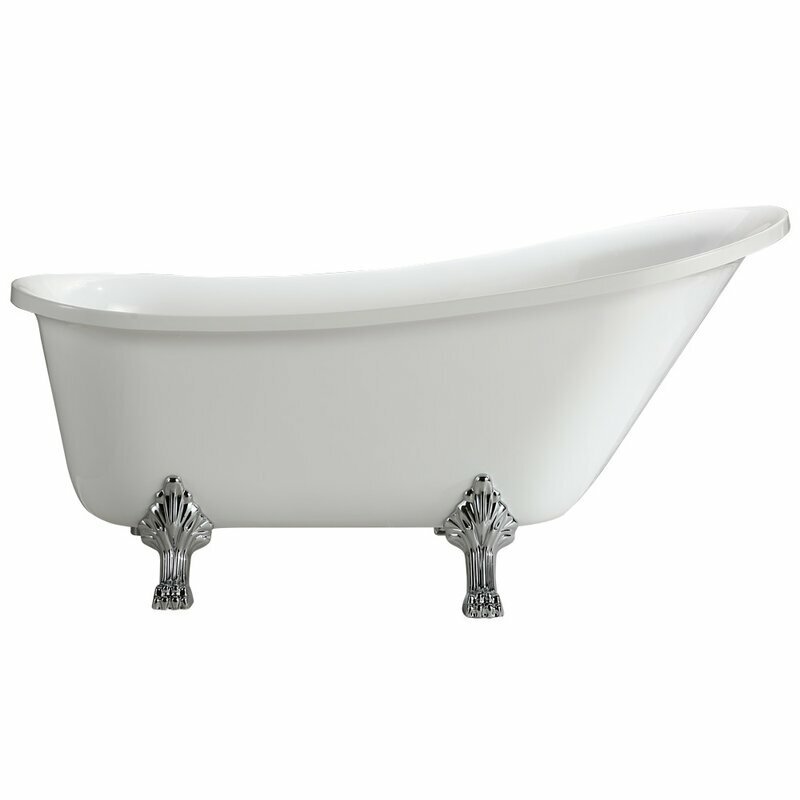 Clawfoot bathtubs need cleaning right around as well as underneath – which might be difficult, especially when they are situated right against a wall. If you decide to stay true to originality, remember that a cast iron tub is not only heavy, but gets even heavier when filled with water. They may hold heat for a longer period than an acrylic bathtub, but keep in mind that they need very hot water to heat up in the first place. Also, their weight may mean you need to do structural changes to your home, especially when you want to install them in a bathroom on the upper level. While you could, technically, use this type of bathtub as a shower, it might not be very convenient to do so. If you want to stand up to take your shower, you may need to install an oval-shaped shower curtain rod and curtains. Add to this that you would also have to install a freestanding shower attachment, and the dollars start adding up. 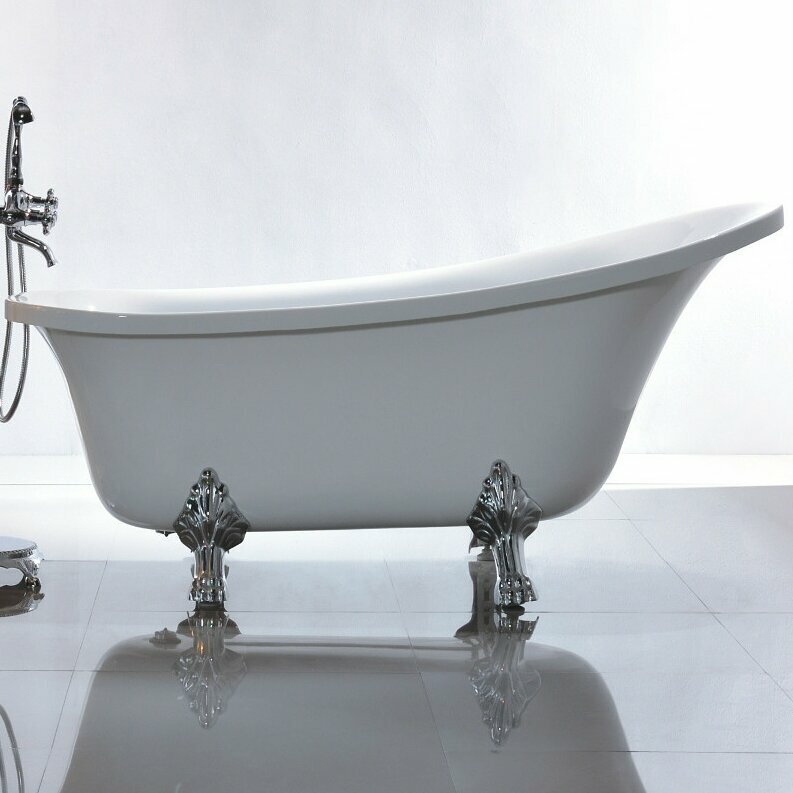 Depending on where you place your freestanding clawfoot tub, you may look at extra costs for plumbing changes. If standing against the wall in the same spot your previous bath stood, that might be okay. But if you wish to change the position entirely, you need to prepare yourself for a hike in installation costs. 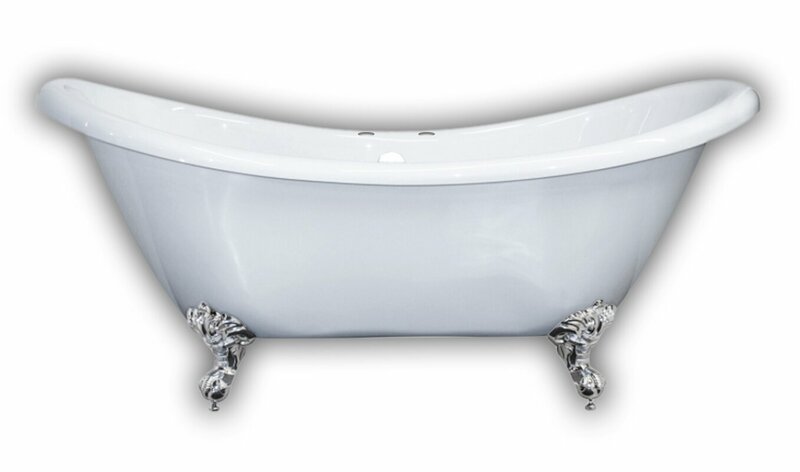 Clawfoot bathtubs tend to be slightly larger and bulkier than standard bathtubs. They are also taller due to their added feet. So when deciding to purchase one, you need to make sure your bathroom is large enough for it to fit – and not end up looking even smaller than it already is. Contrary to popular belief, clawfoot tubs can indeed make a statement even in a modern bathroom. Built of different materials, you are sure to find one that will fit into your bathroom space, giving it that elegant edge with a modern twist. Beautiful, comfortable, and reminiscent of a bygone era, the ‘Jacqueline’ vintage bathtub reminds one of a bygone era, when ladies dressed for tea and men wore top hats and waste coats, and life was immeasurably slower of pace. 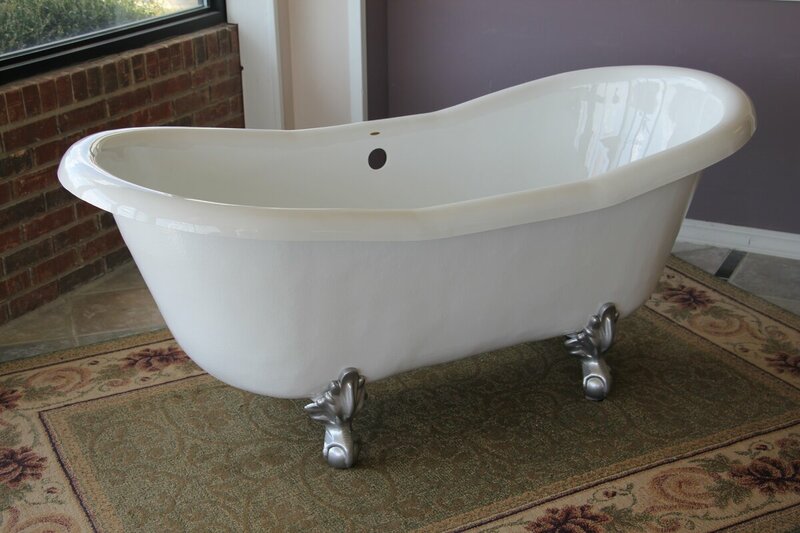 Reminiscent of the Victorian Era – a vintage clawfoot tub that allows you to relax, unwind, and have a great, comfortable soaking experience. The self-levelling legs are a great added advantage that makes for easy installation. The Heisenberg copper bathtub from Sinkology has a decidedly masculine feel to it, although it would fit in a more feminine setting as well. 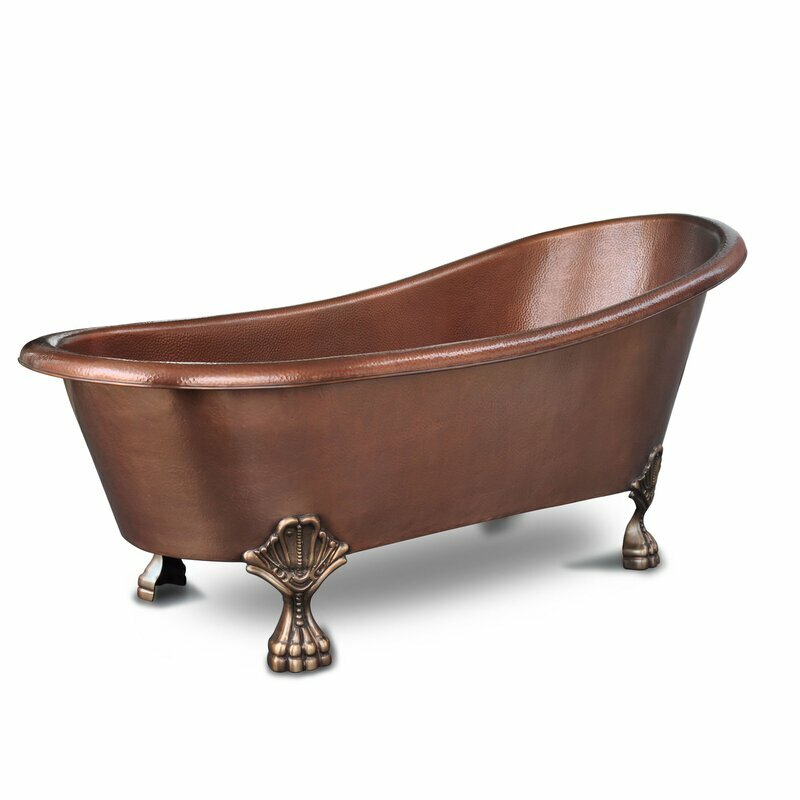 Individually handcrafted, this copper bathtub with is solid bronze feet are a testament to great artisanship. This tub is definitely a contender for the title of best clawfoot bathtub. This traditional, two-sided bathtub has raised ends on both sides, allowing for easy access from either end. This allows you to decide on your view of choice while bathing. Besides the luxury of cast iron that makes up the bath, the beautifully detailed lion’s paw feet in a polished chrome finish adds that extra touch of plushness. 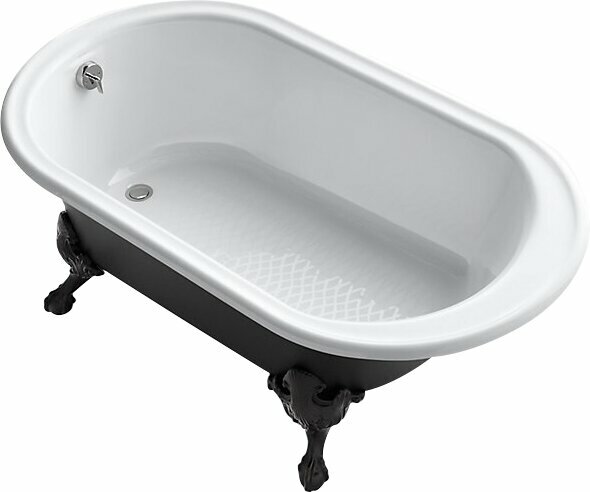 A modern take on history, finished in black on the outside and white on the inside the slip-resistant bottom of this classically designed bathtub from Iron Works is a perfect piece for a traditional or Victorian style setting. Adding modern with traditional, the integral lumbar support and extra spacious width ensures a seamless blend of old and new. A romantic design reminiscent of a century ago yet with a lightweight design that ensures no extra building work is needed, this fully acrylic bathtub gives you the best of both worlds. Add to this the roominess of the tub, which could incorporate two people, and you have a surefire winner. This slipper bathtub incorporates a beautiful white finish and four adjustable height levelling legs, making installation so much easier. The design of the Vernon Clawfoot bathtub is not only elegant, but will show up your master or guest bathroom to perfection. The bathtub is made of durable, lightweight acrylic, meaning installation does not call for any costly building renovations for installment beforehand. The bathtub, finished with a clawfoot design, has an overflow drain. The Dorya adds a touch of elegant, old-fashioned sophistication to any bathroom. Classic and contemporary in design, the bathtub is finished with luxurious ornate chrome feet and a faucet and handheld shower. The Duchess, with its double raised edges, is a slipper bathtub that brings the old into the new, providing old-fashioned elegance without the old-fashioned inconvenience. Will it be necessary to change my bathroom’s plumbing if I want to install a clawfoot tub? Not necessarily. It largely depends on your drain placement as well as your water supply to the bathroom. Taking this into consideration, you should be able to find a freestanding, clawfoot tub that will fit your bathroom space. While there are pros and cons attached to buying the best clawfoot tub for you and your family they really do add that extra class to anyone’s sense of style. Going through the reviewed list, picking ‘the best’ one is most certainly difficult. So we decided to go for something different. Our pick is the TBT-6631CL-OF Heisenberg 67.5″ x 32″ Soaking Bathtub by Sinkology. We adore the copper patina, and the overall look of this bathtub. We feel it is one that will do equally well in a more male OR female setting making it a versatile addition to your bathroom. We also loved the fact that it is handcrafted, which simply adds to one’s appeal of ‘exclusivity’.